Showcasing some of our Local and International Charities and the Contribution that Rotary Clubs regularly make to the Community. Presenting Polio Plus and the part that Rotary International has played in bring about the near eradication of Polio in the world today. they experience any type of conflict. Roger Pannell: Trustee and Project Manager. In 2009 the Osiligi Charity Project was officially formed to help the Osiligi Maasai Warriors’ community in Kenya. There were two main projects in mind—Education (building a school) and Clean Water (providing solar bore holes and pumps) concentrating on the 100 square miles around their community. Christine is passionate about ensuring that those who are experiencing mental health difficulties are offered appropriate support in a timely manner. Dorset Mind is an independent charitable provider of mental health services. We work across Dorset, offering support to anyone in the county and facing a mental health problem, or caring for those who are. Out in the cold, roaming the streets, looking depressed and sometimes unwell. These are some of the situations people can find themselves in across all sections of life, affecting all ages young and old right here in our community. 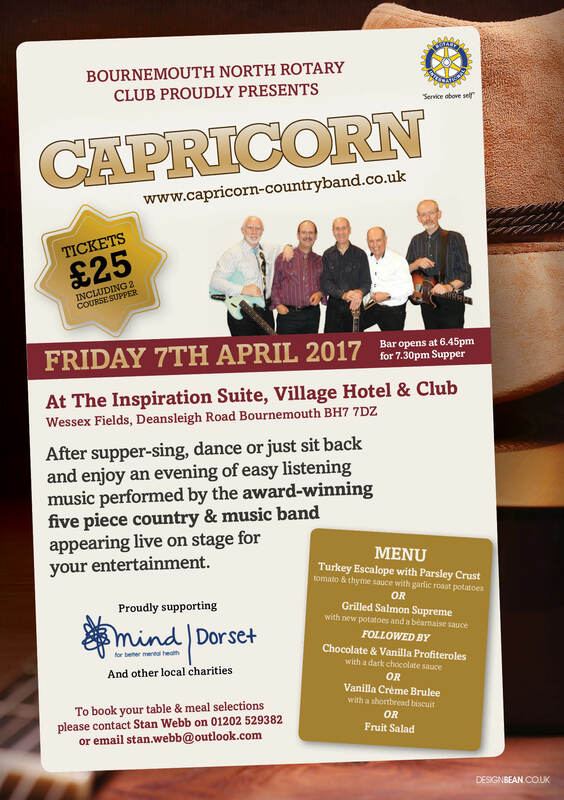 After supper – sing, dance or just sit back and enjoy an evening of easy listening music performed by the award winning five piece country and music band “Capricorn” appearing live on stage at the Village Hotel Bournemouth. Presented by the Rotary Club of Bournemouth North and proudly supporting Dorset Mind and other local charities. Dorset mind are an independent charitable provider of mental health services working across Dorset, offering support to anyone in the county and facing a mental health problem, or caring for those who already are. Join us for an enjoyable evening of good food, good music and good company. A “Double Reed Day” was held at Pelhams on Sunday 5th February which was part sponsored by The Bournemouth North Rotary Club. A group of enthusiastic players of the Bassoon and Oboe gathered at Pelhams Community Centre over the weekend under the auspices of the Broadstone Music Series. The morning sessions were a series of master classes under the watchful eye of professional players from the Bournemouth Symphony Orchestra (BSO), followed by the young players working on their individual development. The day ended brilliantly with a mini concert featuring some favourites such as ‘The Sun Has Got It’s Hat On’ and the ‘Dambusters March in amongst pieces by Jean Boismortier and Handel.